AF rated portable water mist extinguishers, e.g. UltraFire Water Mist are a new type of broad spectrum extinguisher. These extinguishers are the first extinguishers that can tackle general fires as well as deep fat fryer fires which are very difficult to extinguish. Deep fat fryers currently require fire blankets or specialist wet chemical fire extinguishers to tackle them. As a result households or professional kitchens end up with at least two types of extinguishers but in the future they will just need one type of extinguisher – water mist. Offices, general buildings, factories etc will obviously benefit from this new development as well. The simplicity of the water mist extinguisher and the fact that one extinguisher deals with all risks, also reduces the cost of extinguisher training. The water mist extinguishers are also exceptionally powerful. A 6l water mist extinguisher is as powerful as a standard 9l water extinguisher and offers a strong F rating on top of the normal A rating. The extinguishers also have long discharge times (the 6l version has 65.5 seconds! ), offering even un-experienced users a safe way of fighting a fire. The water mist extinguisher only contains de-mineralised water, hence leaving no residue and can therefore be used in food preparation areas and clean rooms. Refills are obviously cheap and easy to execute. And disposal at the end of the extinguisher life is no issue. The water mist is also suitable for churches and historic buildings as the water mist does not saturate the objects in the building as much as a water extinguisher would and has no harmful substances that could damage wood or soft furnishing. The extinguisher also eliminates the risk of powder inhalation in smaller spaces such as boats or small kitchens. These extinguishers are therefore perfect for indoor installation on small boats. UltraFire water mist extinguishers are using de-ionised water, which cannot conduct electricity. They can therefore be used on electrical items with voltage of over 1000V (1m safety distance). 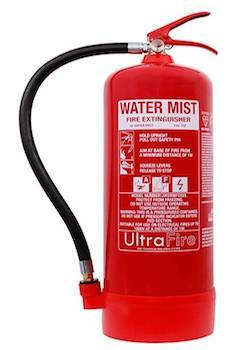 Please note that not all manufacturers of water mist extinguishers are using de-ionised water. Water mist extinguishers are also very powerful. Watch this video to see them in action. Please note whilst B and C fires are demonstrated in this video, the certification has not yet been approved, but you can see how effective they are. In this video, the fire and rescue service tried to tackle identical car fires with different types of extinguisher. The water mist extinguisher was the only extinguisher which successfully extinguished the fire! The extinguisher’s supersonic nozzle disperses microscopic ‘dry’ water mist particles to suppress fires and extinguish burning materials. The particles are attracted by the fire and cool the fire and reduce oxygen content. They are 100% safe for use on wood, paper, textiles, flammable liquids and fat fires. While water based extinguishers currently cannot be tested or classified for gas fires according to British Standards, the dry water mist extinguishers are actually great for extinguishing gas fires. If the extinguisher is used by vandals, there is no risk to life and health. Fire extinguisher technology is constantly evolving, helping to make life easier and fire protection less costly and more environmentally friendly. The E-Series water mist fire extinguishers are taking us a great step forward. A single extinguisher is now able to cover the vast majority of fire risks in offices and households. UK Fire Service Resources recommends Safelincs Safety Products for Water Mist Fire Extinguishers.